Today, I ran. It was 12ºF (-11ºC) and dark outside. And windy. Cold, windy, dark. And it snowed a couple days ago, so there was snow on the track and bike trail. Although I like to run outside, my plan called for a four-mile tempo run at 7:10/mile pace, and it’s difficult to hit these marks in the dark on a snowy track and even harder on the trail. So it was down to the basement for a run on the treadmill. We have an unfinished basement, and it’s been so cold outside that I needed to wear a jacket for most of the first mile until I warmed up. There’s not a lot to look at down there, just lots of concrete and exposed insulation and infrastructure. The main electrical panel is directly in front of the treadmill along with the water meter, and the forced hot water burner was just to my left. It’s very spartan. I don’t mind the treadmill, but—unlike the bike trainer— I don’t really like it either. Mainly it’s just plain difficult. I can push hard on the bike trainer, but then I also have the freedom to slack a little from time to time. On the treadmill, there is no easing up. You set the speed and have to keep up with the belt, which usually isn’t a problem on recovery days, but a tempo run is fast. A lot of it is mental, too, and a couple times in the past I’ve had trouble believing I could hold on for the whole duration. The last mile is always the hardest, but I know this now, and I can usually push through. For a while though, I just couldn’t get it done. I’d have good treadmill runs, but then a bad one would come along and I’d be left wondering how I was ever going to get through a half-marathon at a slightly slower pace. Then I learned two things. First off, my treadmill is a lying liar-pants hellbent on my destruction! If I tell it to give me a 7:10 pace (i.e., 8.4 mph), it will actually give me something in the range of 6:45-6:55/mile. No wonder I couldn’t finish a 4-mile tempo run before; I was trying to run close to my 5K PR pace for longer than 5K distance! Now I back off the speed about 0.2-0.3 mph, which doesn’t sound like a lot, but (according to my Garmin foot pod) it gets me back to the manageable speed I should be running. Secondly, I simultaneously need help with my motivation and some distraction. I need to focus on something less abstract than a race in a couple of months and something more inspirational than an electrical box that I can use as a touchstone to help me get through the last mile or so. I can’t watch TV when I’m running. I’ve tried, but it just doesn’t work for me. On the other hand, still pictures do. 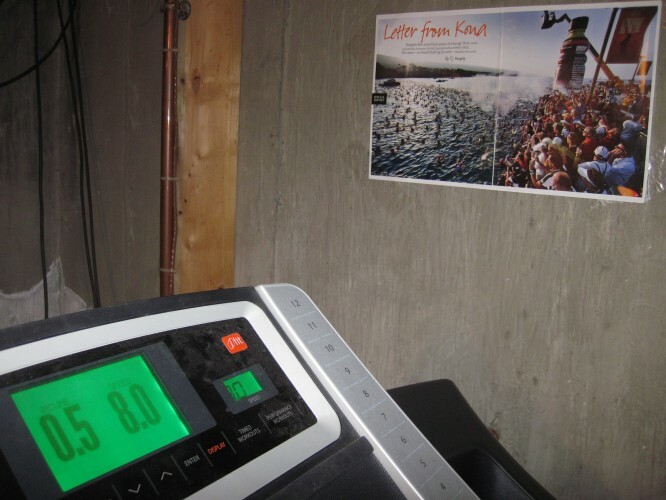 I’ve already taped up one photograph near the treadmill, and there are a couple more I plan on adding once I find them again (including this gem from a while ago). I like being able to look over at the people treading water in Kailua Bay, waiting for the Hawaii Ironman to start, and think about being one of them. It seems silly, but it really works. The picture helps get me moving and keeps me going. I need mental toughness to give everything I can during a race of any distance, and I feel like I’m building it on the treadmill; the picture helps remind me why. Nevertheless, I still can’t wait for it to warm up enough at least to get the snow off the track, because I really feel like I get more out of speedwork outdoors, but it’s nice to know that now I can at least do the workouts I’m supposed to in the basement. How about you? Do you run on a treadmill? How do you approach it? 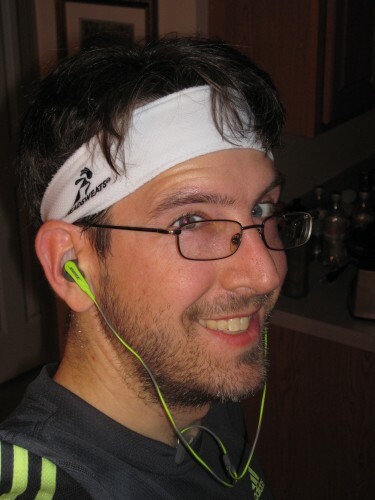 This entry was posted in I am Rembrandt, Running. Bookmark the permalink. oh my science that’s hilarious! Have I thanked you before for translating the F to C? Yes I love that you make your blog understandable to us metric folks! Your basement looks like a real dungeon. with the water damage in the corner of the foundation and the bars on the window it’s like workout prison! Dude… TV or laptop on a stool or SOMETHING! Heck just put on a slideshow of motivational pictures. Though I’m still impressed you go down there at all. You’re awesome! I miss you so effing much! 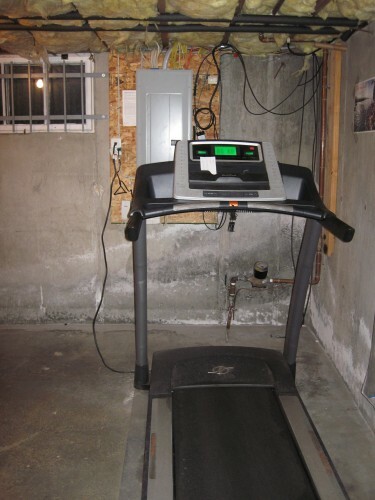 I refer to my treadmill as a $700 cattle prod that pushes me outside. Seriously. My real point is this. Yes, treadmills do lie. And the cheaper your treadmill and the faster you set it, the MORE it lies. Treadmills are calibrated at the factory for walking speed, because – believe it or not – that’s what most people do on them. The faster you go, the less accurate they are, and this is more true on the cheaper machines. Actually, I think even with your adjustment, you’re not being kind enough to yourself. At that pace, I would actually assume a 10% fudge factor.. meaning a 7:10 on the treadmill is actually closer to a 6:35. Of course, your mileage may vary. I’ve been told that if you ever get the chance to run on an Olympic calibre treadmill (I haven’t), the paces are accurate… but us schleps just need to print up fancy conversion charts for ourselves. For what it’s worth, if that were my workout, I would’ve strapped on a heartrate monitor and gone outside and just done whatever to get in that zone for the required time. That’s how much I hate my treadmill. Dude, that looks miserable. And cold. And dark. Oh for goodness sake people. It’s a basement, not a medieval torture chamber.